What is the Hajj? It is the pilgrimage to Mecca, the Islamic holy city in Saudi Arabia. The pilgrimage to Mecca is the last of the five pillars of Islam. Every Muslim, man and woman, who is able, by virtue of health and financial means, is required to undertake hajj. This obligatory, sacred journey takes place in the twelfth and final month of the Islamic calendar every year. As the lunar calendar is eleven days shorter than the Gregorian calendar, the timing for this sacred pilgrimage appears to move forward each year. A Muslim may travel to Mecca during other months of the year, and this is encouraged. But this does not constitute hajj, which must be done communally, with other Muslims during in this sacred time. Last year, 2017, it was estimated that over 2 million people from 70 different countries, took part in hajj. It is an enormous display of Islamic solidarity, with a focus on unity and devotion to Allah. Hajj begins on the 8th day of the 12th month in the Islamic calendar and ends five days later on the 13th. The most holy day of the Islamic year, Eid al Adha, takes place on the 10th day. This year 2018, hajj is thought to commence on Sunday August 19th and finish on Friday August 24th, but the exact timing will be determined by the sighting of the new moon of the 12th month. Mecca is located on the Arabian Peninsula, on the plain of Tihamah in Saudi Arabia. It is the birthplace of Muhammad and the site of his first revelation and his last teaching. It holds a sacred place in the hearts of Muslims as no other place can do. It was, however, a sacred place long before the Muslims claimed it as their own. It is thought that it was here Abraham came to sacrifice his son, a test of faithfulness for the young father. In the Biblical telling of the story, God offered up a wild ram at the last minute in order to spare Isaac's life. Abraham made an alter to God on this place, and since that time, the space has been considered sacred by Jews, Christians and Muslims. Mecca is the home of the kaaba (cube) a large cube-like building. It is believed that Abraham built the first kaaba as an alter to God. All these years later, the kaaba has been altered and rebuilt, but it still represents this foundational act of Abraham and his devotion to God. When Muslims pray, the turn their prayer rugs to face the kaaba in Mecca. In the eastern corner of the kaaba is set 'the black stone', a relic thought to be from the time of Adam and Eve. 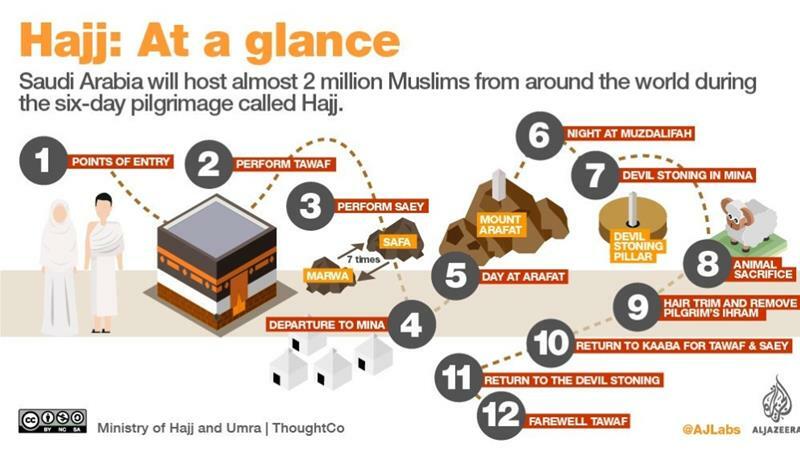 What is done during the five days of the hajj? A lot. And it is all organized and scheduled. There is no wandering around. It is serious business, and in order to keep things safe with so many people, movement is controlled carefully. Each day has a set agenda. It is five days of praying, reflecting, walking, and considering the import of one's faith, encouraged by taking part in a variety of symbolic gestures. Where do you stay and what do you wear? White tents and white clothes. 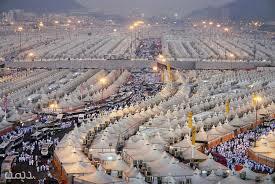 Over a 100,000 large white tents are set up in an enormous tent city for the sole purpose of housing all the pilgrims. As the hajj is a communal gathering, pilgrims are encouraged to live simply and in the company of others, eliminating any signs of wealth so that all may be on equal standing. Men are required to dress in two white cloths that are made without stitches or seams. They wear one wrapped around the bottom part of their body and the other one is wrapped around their shoulders. 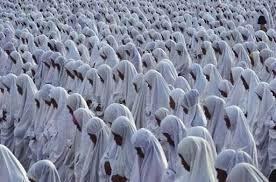 Women wear white garments as well, and usually omit their face coverings. The white cloth symbolizes the purity and simplicity with which the pilgrims are to approach God. 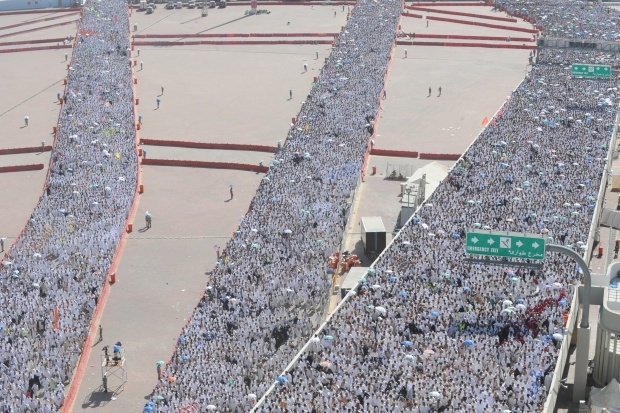 As a spiritual discipline, what is the intent of the hajj? The fifth pillar of the Islamic faith, has the same intention as all the other pillars - to draw a Muslim's attention away from the commercial, materialistic, self-focused ways of everyday life, to the deeper reality of unity in Allah and the Islamic path laid out by Muhammad. And as it is a communal act, it also reenforces the strength of the faith throughout the world and offers a very real experience of world wide solidarity of faith.